▪ Safe for use up to 482° F/250° C and as low as -13° F/-25° C. ▪ Not suitable for broiling or for use with your oven’s grill feature. ▪ Avoid contact with heat sources by placing UltraPro Ovenware at least 2" away from the oven/microwave oven walls and heat sources. ▪ Do not use metal utensils for stirring or serving. 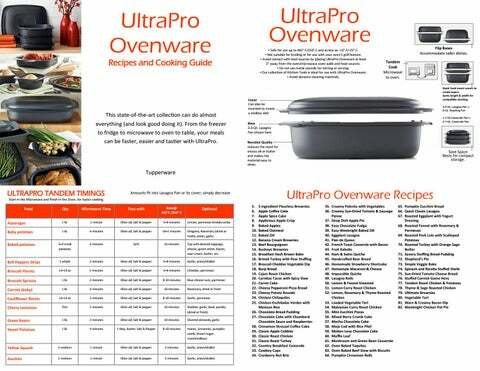 ▪ Our collection of Kitchen Tools is ideal for use with UltraPro Ovenware. ▪ Avoid abrasive cleaning materials. This state-of-the-art collection can do almost everything (and look good doing it). From the freezer to fridge to microwave to oven to table, your meals can be faster, easier and tastier with UltraPro. Base 3.5-Qt. Lasagna Pan shown here Nonstick Quality reduces the need for excess oil or butter and makes the material easy to clean. Save Space Nests for compact storage. Top with desired toppings; cheese, green onion, bacon, sour cream, butter, etc. 5. 6. 7. 8. 9. 10. 11. 12. 13. 14. 15. 16. 17. 18. 19. 20. 21. 22. 23. 24. 25. 26. 27. 28. 29. 30. 31. 32. 33. 34. 1. Preheat oven to 275° F/135° C. 2. In the 2-cup MicroPitcher add cream and microwave on high power 1 minute 30 seconds. 3. Transfer to medium bowl, stir in chocolate chips until melted. 4. Add eggs and vanilla, stir until well combined. 5. Grease the bottom and sides of the of the UltraPro 2-cup Minis with butter. Pour chocolate mixture into pan. Transfer pan to oven. 6. Bake 20-25 minutes, or until brownies are set but still fudge-like. * * Increase bake time by 6 to 8 minutes if you prefer a more cake-like brownie. Preheat oven to 350° F/175° C. Whisk together sugars, cinnamon, and softened butter until combined, should look like wet sand. Whisk in eggs, vanilla, and milk. Stir in flour and baking powder. Pour into Ultra Pro 2-Qt. Square Pan and spread until even with spatula. Stir together melted butter, oats, flour, and brown sugar in a small bowl. Set aside. Assemble Grate Master with slicing cone. Place a small bowl underneath. Place apple quarters one at a time into the hopper and turn handle to slice. Repeat until apple is sliced. Toss with oat mixture and sprinkle onto the top of batter. 8. Top with apple topping and bake for 40-50 minutes or until an inserted knife comes out clean. 1. Grease and flour UltraPro Round Pan. In a medium bowl, stir together apples, cinnamon, brown sugar and salt; set aside. 2. Place butter in the 2-cup/500 mL Micro Pitcher. Microwave on high power 25 seconds, or until melted. Remove from microwave, transfer to base of the Power Chef® System fitted with the paddle whisk attachment. Add sugar. Cover and pull cord until butter and sugar are well blended. 3. Remove cover and add egg, cream, yogurt, vanilla, baking soda and cornstarch. Cover and pull cord until well blended. Remove cover and add flour. Cover and pull cord until well blended. Using a spatula, transfer batter to pan. 4. Spoon apples in an even layer over the top of the batter. 5. Microwave on high power 6 minutes, 30 seconds or until cake is set. Remove from microwave; let stand 1 minute. 6. Remove cake from pan by turning cake upside down onto a cutting board or cooling rack with small grates. Let cool 10 minutes before slicing. Serve warm or at room temperature with whipped cream and a dusting of cinnamon. 1. Preheat oven to 425° F/218° C. 2. Assemble Mandoline with circular knob set to 4 and triangular knob set to “lock”. 3. Attach apple to food guider and slide down Mandoline to slice. Repeat with remaining apples until all apples have been sliced. 4. Place sliced apples in medium bowl, toss with lemon juice, seasoning blend, sugar and flour. 5. In small bowl, combine all topping ingredients and mix well. 6. Place sliced apples in UltraPro 2-Qt. Square Pan, sprinkle with topping evenly. Bake 20 minutes or until apples are cooked through and crisp is golden brown. 1. Preheat oven to 375°F/190°C. 2. To prepare topping, place oats through butter into base of Power Chef System fitted with blade attachment. Cover and pull cord 6–8 times, until pecans are chopped and ingredients mixed. Set aside. 3. Using a Chef Series Pro Paring knife, cut off the top of each apple (about a ¼ inch slice) and reserve. Then cut out core down to about ½ inch from apple bottom. Remove thin slice from bottom of apple so it stands up. 4. Pack ¼ cup topping into apple, replace apple top. Repeat with remaining 5 apples, and arrange in Cover from Ultra Pro Lasagna Pan. 5. Combine apple juice and maple syrup. Pour into bottom of Ultra Pro Cover. 6. Bake 35–40 minutes, or until apple is fork tender. Drizzle apple juice/syrup glaze over apples and serve warm. Preheat the oven to 350°F (180°C). Spray the UltraPro Lasagna pan with spray oil. Combine the oats, sugar, nuts, cinnamon, baking powder, and salt in a Thatsa bowl; mix well. In the small Bowl, whisk the milk, eggs, and vanilla. Add the milk mixture and butter to the oat mixture; stir until combined. Pour the mixture into the UltraPro Lasagna pan . Bake for 35–40 minutes or until the top is golden brown and the oat mixture is set. Cool slightly before cutting into 8 squares. 1. Preheat oven to 425° F/218° C 2. On the UltraPro Lasagna Pan Cover, toss together zucchini, onion, garlic, olive oil and salt. Place pan in oven, bake 8 minutes. 3. Meanwhile using the Microwave Pasta Maker, cook ziti according to package directions. 4. Remove pan from oven, transfer vegetables and juices to the UltraPro Lasagna Pan. Stir in ziti, tomato sauce and mozzarella. Place pan in oven, bake 8 minutes or until cheese is melted and top is lightly browned. 5. Remove pan from oven, top with basil before serving. Preheat oven to 350°F (180°C). Prepare brownie mix according to package directions; stir in ½ cup of the peanuts. Pour into the UltraPro 2 Qt. Square pan. Bake according to package directions or until wooden pick inserted into center comes out clean. Cool completely. Slice two of the bananas; place in single layer over brownies. In a Thatsa medium bowl, combine pudding mix and milk; whisk just until mixture begins to thicken, gently fold in 2 cups of the whipped topping. Spread pudding mixture over bananas. Refrigerate 30 minutes. Slice remaining banana, place over pudding mixture and sprinkle remaining peanuts. To serve, cut dessert into squares; garnish with whipped topping, banana slices and chocolate curls, if desired. 1. Preheat oven to 325° F/162° C. 2. In the ¾-Qt. Stack Cooker Casserole, stir together chocolate chips, heavy cream, butter, vanilla, coffee, and salt. Microwave 45 seconds. Remove from microwave, let stand 2 minutes; stir until smooth. 3. In the base of the Power Chef System with paddle attachment, add eggs. Cover and pull cord until well beaten. Remove cover, add 2 spoonfuls of chocolate mixture to eggs, cover and pull cord until well mixed. Add remaining chocolate mixture and pull cord until well mixed. 4. Transfer chocolate mixture to the UltraPro 2-Qt Square Pan. Place pan in oven. Bake 25 minutes or until a knife inserted in the center of the brownies comes out clean. Remove pan from oven; let stand. 5. Meanwhile, make the Buckeye toppings. In the ¾-Qt. Stack Cooker Casserole stir together peanut butter, powdered sugar, granulated sugar, vanilla, and salt. Microwave on high power 30 seconds or until soft and spreadable. Spoon mixture over brownies; using a knife spread evenly over brownies. 6. In the large 2-cup Micro Pitcher add chocolate chips and cream. Microwave 45 seconds; let stand 1 minute, stir until smooth. Pour chocolate over peanut butter, spread evenly. Sprinkle top with peanuts, gently press into chocolate. 7. Refrigerate 20 minutes to set. Cut into 16 pieces, serve chilled or at room temperature. Preheat oven to 350° F/175° C. In a medium bowl, whisk together all ingredients. Pour egg mixture into UltraPro 2-Qt. Square Pan. Bake, uncovered, 25–30 minutes or until casserole is cooked through and egg has set. Add salt and pepper to taste and serve. 1. Place all brine ingredients in Chef Series 3-Qt. Saucepan over medium-high heat. Bring to a boil, lower heat and simmer 10 minutes. Cool completely. Place thawed turkey breast, skin side down, in UltraPro 6Qt. Roasting Pan. Add brine and fill remaining space with ice. Cover with inverted base of UltraPro 3.5Qt. Lasagna Pan and refrigerate overnight. 2. To prepare turkey, preheat oven to 350° F/190° C. Remove turkey and discard brine. Rinse turkey breast thoroughly with cold water and pat dry. Brush with olive oil and place, skin side up, in UltraPro 6-Qt. Roasting Pan. Roast, uncovered, 1½–2 hours, or until internal temperature reaches 155° F/69° C. 3. To prepare stuffing, in Chef Series 11" Fry Pan over medium-high heat, melt butter with sugar. Add pears and sauté until liquid evaporates and pears begin to caramelize, about 7–8 minutes. Add onions and celery and sauté until translucent, 4–5 minutes more. Set aside to cool slightly. Place stuffing cubes in large bowl and stir in sage, salt and pepper. Heat broth, add to stuffing cubes and stir until absorbed. Fold in pear mixture and eggs. 4. Transfer stuffing to inverted UltraPro Roasting Pan cover. Place in oven next to turkey during last 25 minutes of roasting time. Remove turkey from oven, tent loosely with foil and allow to rest 20 minutes before carving and serving. Remove stuffing after turkey has rested. Serve with gravy. 1. Pre-heat oven to 425° F/218 C 2. Place broccoli in the Power Chef System with blade attachment and chop broccoli into small bite-size pieces. Remove blades. 3. Add sour cream, cheddar cheese and Knorr Vegetable recipe mix using the Silicone Spatula, mix until blended. 4. Pour mixture into the UltraPro 2-Qt. Square Pan and bake in the oven for 25 minutes. Serve and enjoy with tortilla chips, bagel bites, vegetables or crackers. In Thatsa Bowl place 9 cups of flour. Make well in center. Place milk in the Micro Pitcher and microwave for 3 minutes to scald milk. In the Mix n Stor Pitcher mix scalded milk, water, sugar, eggs, salt, and dry yeast. Pour in the center of the flour in Thatsa Bowl. DO NOT MIX. Seal and burp the bowl. Place in warm place until seal pops. (20—30 min.) Melt 1 cup butter, pour over flour mixture then knead a little bit. Leave very sticky. Seal and burp the bowl. Place in warm place until seal pops off (30 + min.) Knead and you are ready to go. Place dough into Ultrapro Loaf pans. 9. Raise again until double in size. 10. Bake at 375°, 25-30 minutes. 1. Preheat oven to 425° F/218° C. Season chicken with salt and pepper to taste. 2. In a small bowl, combine seasonings with butter. 3. Rub 2 tbsp. of butter mixture over chicken skin. Rub remaining butter under the skin and inside the chicken cavity. 4. Place chicken in 3.5-Qt Lasagna pan, breast side up. Microwave on high power 17 minutes. Remove from microwave, baste chicken with pan drippings; transfer pan to oven. Bake 17 minutes or until golden brown and internal temperature registers 160° F/70° C on an instant read thermometer. 5. Remove from oven. Let stand 10 minutes before serving. 1. Preheat oven to 325° F/ 162° C 2. In medium bowl, stir together sour cream, mayonnaise, hot sauce, Cilantro Mojo Seasoning and lime juice. Add coleslaw mix and red onion, tossing well to coat. 3. Cover and refrigerate at least 1 hour or overnight. 4. To prepare tacos - In UltraPro 2.1-Qt. Casserole Pan, combine tomato sauce with onion mixture and 2 tsp. Southwest Chipotle Seasoning. 5. Season pork with remaining 2 tbsp. Southwest Chipotle Seasoning and place in casserole pan with sauce, tucking small ends under. Cover and roast 25 minutes or until internal temperature reaches 155° F/69° C. 6. Remove from oven and allow to rest, covered, 10 minutes. 7. Place tortillas on a microwave-safe plate, cover with moist paper towel and microwave on high power 45 seconds. 8. Slice pork and divide between heated tortillas, top with sauce from casserole pan, spicy slaw and garnish with lime wedge. 1. Preheat oven to 375⁰ F/ 190° C. 2. In Thatsa Medium Bowl, mix flour, sugar and cinnamon until evenly combined. 3. Assemble Grate Master Shredder with large grater cone, place bowl underneath. Place carrots in hopper two pieces at a time and turn handle until grated, pressing down with plunger as necessary. Repeat with remaining carrots until all are grated. 4. Repeat with coconut and pecans. 5. Place carrots, coconuts and pecans into bowl with dry ingredients, reserving ½ cup of the coconut. 6. Make a well in the center add eggs, oil and milk. Mix until well combined. 7. Pour batter into greased Ultra Pro 2-qt. Square Pan. 8. Bake for 30–35 minutes or until toothpick inserted into center comes out clean. 9. Top with remaining coconut. Preheat oven to 400° F/200° C. In medium bowl, whisk together all dry ingredients including Parmesan cheese. Add eggs, olive oil, milk, mozzarella and pepperoni to dry ingredients and stir well to combine. Pour mixture into UltraPro 2-Qt. Square Pan, top with pizza sauce and spread evenly. Bake 30 minutes. Serve warm or at room temperature. Top with additional pizza sauce and cheese, if desired. Preheat oven to 350° F/175° C. Lay potato rounds in a single layer on UltraPro Oven Plate. Sprinkle with salt and cheese. Bake 10–15 minutes or until potatoes can be pierced with a fork and cheese is melted. Top with sour cream, bacon and green onion. Serve warm. Preheat oven to 350° F/175° C. Place onion and garlic in base of Power Chef° Pro System and pull cord until roughly chopped. In medium Thatsa Bowl, combine all ingredients (except tortillas and cheese) to create filling. Cut tortillas into sixths and place a single overlapping layer on bottom of UltraPro 3½-Qt. lasagna Pan. Add ½ filling and top with ⅓ cheese. Add another layer of tortillas, filling and cheese. Finish with remaining tortillas, reserving the last ⅓ cheese. 6. Cover and bake 30 minutes. Uncover, top with remaining cheese and bake an additional 15–30 minutes or until cheese begins to brown. Allow to rest 15 minutes before serving. 1. Place tomatillos in UltraPro 2.1-Qt. Casserole Pan along with ¼ cup of water. Cover and microwave on high power 5 minutes. Drain and allow to cool slightly. Place onion, garlic, jalapeno and cilantro in base of Power Chef System fitted with the blade attachment. Replace cover and pull cord to process until finely chopped. Add tomatillos, replace cover and pull cord to process until all ingredients are finely chopped. Place mixture back in casserole pan, cover and microwave on high power 4 minutes. Season with salt and pepper. Set aside. 2. Place chicken, corn, ½ cup cheese and seasoning blend in medium bowl, stirring together using the Saucy Silicone Spatula. Set aside while preparing rice. 3. Preheat oven to 350° F/175° C. Place onion and garlic in base of Power Chef System fitted with the blade attachment. Replace cover and pull cord several times until finely chopped. Place onion mixture, tomatoes, broth and seasoning blend in UltraPro 3.5-Qt. Lasagna Pan. Microwave on high power 4 minutes. Add rice, stirring to combine. Cover and bake 25 minutes. 4. Divide filling between tortillas and roll. Spread ¾ cup salsa verde on bottom of inverted UltraPro Roasting Pan cover (or use inverted Lasagna Pan cover and place aluminum foil over rice). Place enchiladas in cover, folded seam down, and top with remaining salsa verde. Sprinkle remaining cheese on top. Remove cover from rice and place inverted cover containing enchiladas on top. Bake, together, an additional 15 minutes or until heated through. 1. Preheat oven to 350˚F/176˚C. 2. Spray UltraPro 2-cup mini with cooking spray and set aside. 3. Combine eggs, milk, oil and vanilla in base of Power Chef. Add flour through salt. Turn handle to mix until smooth. Add boiling water, mix until smooth. 4. Divide mixture between two Ultra Pro minis. Sprinkle 2 tbsp. mini chocolate chips on top of each. 5. Bake 30-35 minutes or until a toothpick inserted into center comes out clean. Cool 10 minutes, remove to rack and cool completely. 6. Place all ingredients in 2 cup Micro Pitcher. Microwave on high power one minute; stir; microwave an additional 30-45 seconds and stir well. Sauce thickens as it cools. 7. Slice each cake into 4 slices, place on a platter, garnish with Chambord Chocolate sauce and fresh raspberries. 1. Preheat oven to 350° F/175° C. 2. Cut loaf into 1" cubes and place in greased UltraPro 3.7Qt. Casserole Pan, 3. In medium bowl, whisk eggs, sugar, milk, seasoning blend and salt until combined. Pour mixture over bread and sprinkle chocolate chips over top. Press bread and chocolate chips into bread mixture to disperse chips and help bread soak up milk mixture. Let rest for 20 minutes before baking for 60-70 minutes. 4. Place chocolate dessert blend, heavy cream, cinnamon-vanilla seasoning and brown sugar in 2-cup Micro Pitcher. Microwave on high power 1 minute. Stir and microwave an additional 30-45 seconds. Stir well. Sauce will thicken as it cools. 5. Serve warm with a drizzle of Chocolate Syrup. 1. Heat oven to 350º F /180º C. Grease and flour 9" Round UltraPro Pan. 2. Whisk together baking mix, sugar, sour cream, butter, vanilla and egg in a medium bowl. Spread batter in prepared 9" Round UltraPro Pan. 3. In a small bowl, mix streusel ingredients together until crumbly. Using half the cinnamon streusel mixture, sprinkle over cake batter, swirl into batter using a Silicone Spatula. 4. Sprinkle remaining streusel over batter. 5. Bake 20-25 minutes or until golden brown. Cool 10 minutes. 1. Preheat oven to 375° F/190° C. 2. In medium bowl, toss sliced apples with lemon to keep from browning; add brown sugar, flour, salt and seasoning blend and toss to coat. 3. Pour apple mixture into buttered UltraPro 1.6-Qt. Round Pan; set aside. 4. In small bowl, combine topping ingredients and mix thoroughly until combined; spoon mixture over apples. 5. Bake 35–45 minutes until topping is golden brown. Serve with vanilla ice cream. Preheat oven to 350° F/175° C. Place turkey in base of UltraPro Roasting Pan. Brush bird with olive oil and season liberally with salt, pepper and any other desired dried spices. Place in oven and bake 2–2 ½ hours or until turkey reaches an internal temperature of 165° F/75° C and juices run clear. Let rest 15 minutes before slicing. Note: If desired sprinkle with dried rosemary, oregano and/or thyme. 1. Preheat oven to 450°F. 2. Chop onions and bell pepper using Quick Chef Pro System; place in UltraPro Square pan. Add potatoes, bacon and oil; mix well and spread evenly over bottom of pan. 3. Bake 20 minutes, stirring potato mixture after 10 minutes. 4. Reduce oven temperature to 325ºF. 5. Remove UltraPro pan from oven and make 4 impressions in potato mixture with back of a Spoon. Break an egg into each impression. Sprinkle with salt and black pepper. Return to oven; continue baking 15 minutes or until eggs are set. 6. Remove from oven. Sprinkle cheese evenly over eggs. 1. Preheat oven to 425° F/218° C. 2. Place ground beef and salt in Thatsa Medium Bowl, set aside. 3. In the base of the Power Chef® System, fitted with blade attachment, combine potato and onion. Cover and pull cord until potato and onion is well minced. 4. Transfer potato mixture to bowl with ground beef; stir with fork until well combined. Divide equally between four Ultra Pro 2-cup/500 mL Minis. Do not press beef into pan, mixture should remain loose. 5. Microwave on high power 4 minutes. Transfer to oven. Bake 4–6 minutes or until beef is cooked through. Remove from oven, top with favorite BBQ sauce. Preheat oven to 375° F/190° C. Combine water, polenta and ½ tsp. salt in UltraPro 3.5-Qt. Lasagna Pan. Invert Lasagna Pan cover and place asparagus and cherry tomato halves on top. Drizzle vegetables with olive oil and sprinkle with black pepper and remaining salt. Place inverted cover over base and bake together 25 minutes. 5. Remove from oven, stir Parmesan into polenta, and serve with vegetables. 1. Preheat oven to 350° F/175° C. 2. Prepare pasta according to package directions using the Microwave Pasta Maker; set aside. 3. Place 1 tbsp. of reserved tomato oil in fry pan over medium heat; cook Italian sausage until browned and cooked through. Remove from fry pan and set aside. 4. In same fry pan, heat additional 1 tbsp. reserved tomato oil over medium heat and sauté tomatoes, garlic, onions, peppers, seasoning blend and salt 2–3 minutes. 5. Add milk and cream to fry pan. 6. In small bowl, whisk cornstarch into water until dissolved, add to fry pan and bring sauce to a low simmer. 7. Stir Italian sausage into sauce in fry pan. 8. Combine pasta and sauce in UltraPro 3.7-Qt. Casserole Pan and stir. 9. Top with mozzarella cheese and bake 15–20 minutes until cheese is melted and casserole is warmed through. 10. Place baguette slices into inverted UltraPro Casserole Pan cover. 11. Using a pastry brush, brush tomato oil onto top side of baguette slices. 12. Combine seasoning blend and Parmesan cheese and sprinkle on slices. 13. Bake 12–15 minutes or until crispy. 1. Preheat oven to 350° F/175° C. Cut apples into ½″ pieces. 2. In the UltraPro 2-Qt. Casserole Pan mix together apples, butter, flour, cinnamon, sugar, and salt until well combined. Microwave on high power 8 minutes. 3. Meanwhile, make the topping. In a medium bowl, stir together flour, brown sugar, granulated sugar, salt, and cinnamon. Cut in butter pieces with a pastry blender, or rub butter and flour mixture between fingers until coarse crumbs form; set aside. 4. Remove pan from microwave. Sprinkle topping evenly over top of apples. Place pan in oven. Bake 12 minutes, or until topping is golden brown and filling is bubbly. Remove from oven; let stand 10 minutes before serving. 5. Serve warm, or at room temperature. Refrigerate, covered, up to three days. 1. 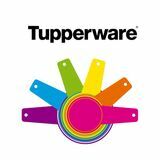 Combine chocolate chips and sweetened condensed milk in TupperWave Stack Cooker 1¾-Qt. Casserole and microwave on high power 2½–3½ minutes, stopping to stir halfway through. 2. Stir in vanilla. 3. Line UltraPro 2-Qt. Square Pan with parchment paper. Pour mixture into pan and refrigerate until set, 1 –2 hours. 4. Remove from pan before cutting. 5. Store in a sealed Tupperware container. 1. Preheat oven to 375° F/190° C 2. Brush 1 tsp. olive oil on the UltraPro Lasagna Pan Cover and Base, line a single layer of eggplant in both Cover & Base (see picture above), sprinkle with salt. Place pan in oven, bake 20 minutes. 3. In the base of the Power Chef System with the blade attachment, add carrot, celery, shallot and garlic, place cover on and pull cord until diced. 4. Pour diced vegetable into the 1 quart Micro Pitcher, add remaining olive oil, microwave at 50% for 3 minutes, open Micro Pitcher, add sugar, tomatoes, pinch of salt & pepper and two chiffonade basil leaves, recover, microwave at 50% for 8 minutes. 5. Pour small amount of tomato sauce in the UltraPro Lasagna Pan, add a layer off eggplant (see above picture), topped with two chiffonade basil leaves. Repeat layers. 6. Add layer of mozzarella, top with parmesan cheese. 7. Place UltraPro Lasagna Cover on and bake for 20 minutes. 1. Heat oven to 350°F. In small saucepan over medium high heat, add sugar and ½ cup water. Bring water to boil, stirring constantly until sugar dissolves. Continue to cook sugar mixture, without stirring, until deep golden brown and caramelized, about 15 minutes. Carefully pour caramel into the 1.75 Qt. UltraPro Loaf pan, quickly swirling to evenly coat bottom before caramel hardens; set aside 2. In medium mixing bowl, using hand blender or whisk, beat together cream cheese and eggs until smooth. Whisk in condensed milk and evaporated milk until smooth and combined. Pour cream cheese mixture into loaf pan with caramel; cover tightly with foil. Place 1.75 Qt. UltraPro Loaf in larger, 3.75 Qt. lasagna UltraPro pan. Pour enough hot (not boiling) water into 3.75 Qt. Lasagna UltraPro pan, until water comes halfway up sides of loaf pan. 3. Transfer pan to oven. Bake until flan is set (thin knife inserted into center will come out clean), 40-45 minutes. Remove loaf pan; discard foil. Let sit until cool. Transfer loaf pan to refrigerator until chilled, at least 2 hours. To unmold, run thin knife around edges of flan. Invert onto serving plate. Preheat oven to 350° F/175° C. Assemble kabobs by rotating fruit onto each kabob. Place kabobs on UltraPro Oven Plate and bake 10 minutes or until fruit is slightly warm. Melt chocolate by microwaving in 1-Qt. Micro Pitcher at 50% power 1–2 minutes. Remove from oven and drizzle kabobs with melted chocolate. 6. Serve warm. 1. Heat oven to 400º F /200º C. 2. Sprinkle ham, cheese and onions evenly over bottom of 9" UltraPro Round Pan. 3. Whisk together baking mix, milk, eggs and salt and pepper until well blended. Pour mixture gently over ham, cheese and onions. 4. Bake 35 to 40 minutes or until toothpick inserted into center comes out clean. Cool 15 minutes. 1. Preheat oven to 375° F/190° C. 2. Coat UltraPro 2-Qt. Square Pan with butter and set aside. 3. Sift flour and sugar and place in medium bowl. Make a well in center of flour mixture and pour beer into well. Mix thoroughly using the Saucy Silicone Spatula. 4. Pour batter into square pan and bake 45 minutes. Brush bread with melted butter and bake an additional 10 minutes until golden brown or until a toothpick comes out clean when inserted into loaf. 5. Cool pan on a wire rack 10 minutes. Turn bread onto rack and cool completely. If baking, preheat oven to 350° F/175° C. In medium bowl, stir together biscuit mix, sugar, milk, ½ stick butter, vanilla and egg. Use remaining butter to grease base of UltraPro 2-Qt. Square Pan and add batter to pan. Bake 25 minutes OR microwave at 70% power 8 minutes. Combine heavy cream, sugar and vanilla in base of Power Chef System, cover with Whip Accessory and turn handle until stiff peaks form. 6. Use Slice ’N Wedge to slice or wedge strawberries. 7. Serve cake topped with whipped cream and strawberries. 1. Preheat oven to 400° F/190° C . 2. Pour noodles into Microwave Pasta Maker and add 4 cups water. Microwave on high power 10 minutes. Drain and add to medium bowl. 3. Meanwhile, melt butter in pan over medium heat. Whisk in flour. 4. Pour milk and salt into butter flour mixture and bring to a boil, stirring constantly. Mixture will thicken once it boils. 5. Add cheese and whisk until melted. 6. Pour cheese sauce over noodles and stir to combine. 7. Pour into UltraPro 2-Qt. Square Pan and place uncovered in oven for 30 minutes or until mixture is hot and bubbly. 1. Preheat oven to 375° F/180° C . 2. Crack eggs, milk, mustard, salt, pepper and herbs into a Quick Shake Container place lid on and shake until well blended. 3. In a medium mixing bowl, add onion, bacon, cheese and flour, stir, add contents from the Quick Shake Container, stir to mix. 4. Pour into an UltraPro 9” Round Pan and bake for 30-35 minutes. Can also be microwave @60% for 12 minutes. 1. Cook lasagna noodles according to package directions. 2. Preheat oven to 350° F/175° C. 3. Meanwhile in a medium bowl, whisk together ricotta, Parmesan, Italian Seasoning Blend, salt and egg until combined. 4. Once noodles are cooked, drain and run under cold water to cool off. Lay noodles flat and cut them in half. 5. Spread approximately 2 tbsp. of ricotta mixture onto each cut lasagna noodle. Roll up and press seam side down into UltraPro 3.5-Qt. lasagna pan. Lasagna pan base fits approximately 15 rolls. Once base is full 15 more will fit on the inverted cover. 6. After all are rolled in UltraPro, spread 1½ cups of marinara sauce over each set of rolls. Then sprinkle each with a cup of mozzarella cheese. 7. Bake 15–20 minutes or until rolls are heated through. 1. Preheat oven to 350°F/180°C. 2. Place half of the lemon slices and fennel onto the UltraPro 2 qt. casserole base, before layering with the fish fillets. 3. Layer remaining lemon slices and fennel, along with the cherry tomatoes, parsley and capers on top of the fish. 4. Drizzle with white wine and olive oil or butter. Season generously with salt and pepper. 5. Cover with UltraPro 2 qt. casserole cover, place into the oven and bake for 25-30 minutes. Remove from oven. 6. Serve fish fillets with a side of salad. 1. Preheat oven to 350°F/180°C. 2. Wash and prepare chicken place onion quarters and place pieces into chicken’s cavity. 3. Place sliced, onions in base of UltraPro 3.5-Qt Casserole pan, topped with sliced lemons, place chicken on top. 4. In a small bowl, mix garlic and olive oil, drizzle over chicken. 5. Roughly chop rosemary and thyme and sprinkle over chicken. 6. Season chicken with salt and pepper to taste. 7. Cover chicken with UltraPro Casserole cover and bake for 1 hour or until golden and tender, removing Cover in the final 10 minutes of cooking. 1. Preheat oven to 350°F/180°C. 2. Add shallots, leek, spring onions and oil into the UltraPro Quiche. Place into microwave and cook at 80% watts for 3-4 minutes. 3. Add zucchini into the UltraPro Quiche. 4. Add eggs, parmesan, ricotta and thickened cream into a Thatsa Bowl Junior; mix to combine. Pour mixture into the Ultra Pro Quiche; gently mix together with the other ingredients. Season with salt and pepper. 5. Arrange tomato slices on top of tart. Place into the oven and cook for 30 minutes or until cooked through. 6. Serve with a sprinkle of fresh basil leaves and crumbled feta. Set Mandoline round knob to #6, triangular knob to “lock” and select the straight v-shaped blade insert. Using food guider, slice zucchini. Spread out zucchini slices on UltraPro Oven Plate. Top each slice with about 1 tsp. of marinara. Microwave for 2 minutes or until zucchini have softened. Top with shredded Parmesan cheese and microwave for 10-20 seconds, or until cheese melts. Preheat oven to 350° F/ 175° C. Place butter in 2-cup Micro Pitcher and microwave on high power 20 seconds or until melted. In medium bowl, combine melted butter, sugars, cinnamon vanilla, salt and cake flour. Stir set aside. In 1-cup/250 mL Micro Pitcher, warm raspberry preserves by microwaving on high power 20-30 seconds. Place blueberries in medium bowl, pour warm preserves over berries; set aside. Use room temperature butter to coat UltraPro 3.5-Qt. Lasagna Pan, set aside. In 2-cup Micro Pitcher, microwave ¾ cup butter on high power 1 minute or until melted. Pour into base of Power Chef° System, set aside to cool. 8. In medium bowl, combine flour. baking soda, salt and sugar; set aside. 9. Add buttermilk and eggs to melted butter in Power Chef base fitted with the paddle attachment. Replace cover and pull cord 3-4 times to mix. 10. Gradually add flour mixture to liquids in base of Power Chef System, pulling 3-4 times to mix. 11. Pour batter into lasagna pan. Spoon berry mixture over cake batter, followed by topping mixture. Bake 3540 minutes or until toothpick comes out clean when inserted into cake. 1. Preheat oven to 350°F. For cake, evenly rub bottom and sides of 1.6 Qt. UltraPro Round pan with 1 tablespoon of the butter. 2. In a Thatsa bowl medium, whisk together sour cream, eggs and instant coffee. 3. Microwave remaining butter in 2 cup Micro Pitcher on HIGH 30-60 seconds or until melted. Whisk butter into egg mixture until well blended. Add cake mix and pudding mix; mix well. Pour batter into 1.6 Qt. UltraPro Round pan, spreading evenly. Bake, uncovered, 33-35 minutes or until center feels firm to the touch. cool 5 minutes. 4. Carefully invert cake. Brush coffee liqueur over top and sides of cake. Spread ganache over top of cake, allowing to drip down sides. Sprinkle toffee along bottom edge of cake, pressing against sides. If ganache becomes too thick to spread, warm slightly in microwave on 15-30 seconds. 1. Preheat oven to 350° F/ 175° C. 2. Place onion and garlic in base of Chop ’N Prep Chef, cover and pull cord 4–5 times to finely chop. Combine chopped onion and garlic as well as chicken stock in UltraPro 3.7-Qt. Casserole Pan. Cover and microwave on high power 6 minutes. In small bowl, combine tomatoes with 1 tsp. olive oil, ½ tsp. salt and ¼ tsp. pepper, tossing to combine. Remove casserole pan from microwave and stir in rice. Invert casserole pan cover and place tomatoes in cover. Place inverted cover on casserole pan, transfer stacked pieces to oven and bake 20 minutes with no additional cover over tomatoes. 3. Brush fish with olive oil and season with Cilantro Mojo Seasoning Blend. Remove casserole pan from oven, remove cover containing tomatoes and stir peas, remaining salt and pepper, and parsley into rice. Add fish to inverted cover, moving tomatoes aside. Re-stack and bake an additional 12–14 minutes. 4. Place olives, capers, parsley and vinegar in base of Chop ’N Prep Chef. Cover and pull cord 4–5 times until all ingredients are finely chopped. Serve filets garnished with kalamata tapenade. 1. Preheat oven to 350°F/175°C. 2. Add milk and melted butter to Power Chef System base with paddle attachment first, and then add sugar, flour, dessert blend, baking powder and salt over liquids. Cover and pull cord 2-3 times to blend. 3. Divide batter between four UltraPro 2-Cup Minis. Place UltraPro Minis on baking sheet. 4. In a small bowl prepare topping and sprinkle over batter. Pour hot water over the top, do not stir. 5. Bake 30 minutes until the center bubbles and is almost set. Remove from oven and let stand 15 minutes. If planning to share, spoon into dessert dishes, spooning sauce from the bottom of UltraPro Mini over the top. 1. In a medium bowl, stir together muffin mix and water. 2. Use softened butter to grease UltraPro 1.75-Qt. Loaf Pan. Pour in muffin batter. 3. Microwave, uncovered, on high power 5 minutes or until knife inserted into center comes out clean. 1. Preheat oven to 375° F. 2. Place onions and garlic in base of Chop ’N Prep Chef. Pull cord several times to finely chop. 3. Place onions and garlic in UltraPro 2.1-Qt. Round Casserole Pan, add mushrooms, oil and herbs, stirring to coat. Cover and microwave on high power 6 minutes. Stir in flour, cover and microwave 2 minutes. Stir in broth, sour cream, heavy cream and green beans, stir. 4. Top with parmesan cheese and French fried onions. 5. Bake in the preheated oven until hot and bubbling, 25 to 30 minutes. 1. Preheat oven to 400° F/205° C 2. In a medium bowl stir together chicken, cream cheese, Southwest Chipotle Seasoning Blend, shredded cheese, green onions and cilantro (if using). Stir until thoroughly combined. 3. Place 2–3 tbsp. into each tortilla and roll tightly to form taquito. 4. Place taquitos in UltraPro 3.5-Qt. Lasagna base and bake 15–18 minutes or until tortillas begin to brown. Serve warm with salsa. 1. Preheat oven to 355° F/ 180° C. 2. Place onion, garlic and carrots in UltraPro 6-Qt. Roasting Pan. 3. In large bowl, combine flour and 1 tbsp. seasoning blend. Add beef cubes and toss to coat. Add beef and excess flour to roasting pan, cover and microwave on high power 6 minutes. 4. Remove from microwave and add potatoes. 5. Whisk together tomato paste, Worcestershire sauce and 1 cup beef stock in 2-cup/500 mL Micro Pitcher. Add to roasting pan, along with remaining stock, and stir to combine. 6. Cover and transfer to oven 1 hour and 30 minutes. 7. In medium bowl, combine biscuit baking mix, remaining seasoning blend and sugar, add beer or milk and mix until just combined. Stir in cheese. 8. Remove stew from oven and uncover. Invert cover and brush with oil. Drop biscuit dough, by the tablespoonful, onto inverted cover, making 14 biscuits. 9. Stack cover over roasting pan containing stew, place together in oven and bake 30 minutes or until biscuits are golden brown. 1. Preheat oven to 350 degrees. 2. Roll out each can of crescent dough and pinch the perforations together with your fingers. Go over it once or twice with a rolling pin to make sure there aren't any holes. 3. Spread pumpkin puree onto the each crescent dough rectangle (2 rectangles). 4. Sprinkle with brown sugar and pumpkin pie spice. 5. Roll the dough up into the shape of a log and cut into 8 cinnamon rolls, of each rectangle. 6. Place in the UltraPro Lasagna Pan. 7. Bake for 20 minutes or until golden brown. 8. Take out of the oven and allow them to cool slightly 9. In a medium bowl cream together butter and cream cheese with mixer until smooth. 10. Add in powdered sugar 1 cup at a time. If frosting is too thick add a splash of milk. Preheat oven to 350° F/175° C. In a medium bowl, whisk together sugar, oil, eggs, pumpkin, water and vanilla. Set aside. In another medium bowl, whisk together baking powder, baking soda, salt, spices and flour. Whisk wet and dry ingredients together until well combined. Assemble Grate Master Shredder with fine cone. Place zucchini in hopper and turn handle to shred, using plunger to push last of zucchini, when necessary. 6. Fold 1–2 cups shredded zucchini into batter. 7. Pour batter into greased UltraPro 2-Qt. Square Pan. Bake 30–40 minutes or until knife comes out clean. 1. Preheat oven to 350°F/180°C. 2. Place eggplant halves skin down on to inverted UltraPro 3.5-Qt. Cover. 3. Mix crushed garlic with olive oil and drizzle over eggplant and season with salt and pepper. 4. Sprinkle spices over eggplant. Pour over the lemon juice and scatter lemon zest. 5. Place into the oven for 35 minutes or until softened and golden. 6. Serve with a dollop of yogurt, fresh coriander and a sprinkle of sumac. 1. Preheat oven to 425° F/218° C. 2. In a medium bowl, toss together mozzarella and parmesan. Set aside. 3. Place beef, ground sausage and onion in Stack Cooker Colander. Stack above 1¾-qt. casserole. Cover and microwave on high power 6–8 minutes, stirring halfway through. 4. Combine cooked meat with tomatoes, Italian seasoning, garlic and salt. Stir to combine. 5. Spread 2 cup meat sauce in base of UltraPro Lasagna Pan. 6. Lay 4 noodles over sauce. Spread 1 cup ricotta over noodles and sprinkle 1 cup of cheese mixture. 7. Spread 2 cup meat sauce over cheeses and place 4 noodles over sauce. 8. Repeat this process again until you have ended with meat sauce on top. Reserve remaining mozzarella and parmesan cheese until after microwaving. 9. Cover lasagna and microwave on high power 20 minutes. 10.Remove cover, add remaining cheese mixture, and bake 10 minutes covered and 10 minutes uncovered, or until noodles are cooked through. Let rest 10–15 minutes before cutting. 1. Preheat oven to 425 F. 2. On the UltraPro Oven Plate arrange fennel and shallots. 3. In the small MicroPitcher add garlic, butter, rosemary and salt. Microwave on high power 30 seconds or until butter is melted. Pour butter mixture over fennel and shallots. 4. Place oven plate in oven. Roast 25 minutes or until fennel is soft and slightly caramelized. Remove plate from oven, garnish with freshly shaved Parmesan before serving. 1. Preheat oven to 350° F/175° C. 2. Make the orange butter. In the base of the Power Chef® System fitted with blade attachment, add garlic, 5 sage leaves orange marmalade and butter. Cover and pull cord until garlic is well minced. 3. Prepare the turkey. Using disposable towels, pat turkey dry. * Spread ¾ of the butter mixture evenly under the skin of the turkey breasts. Rub remaining butter over entire turkey and sprinkle with salt. 4. Stuff turkey cavity with sage, onion and orange segments. 5. Place turkey in the UltraPro Roasting Pan. 6. Place roasting pan in oven on lower rack. Roast 1½ hours. Increase oven temperature to 400° F/205° C. 7. Continue roasting an additional 15 minutes per pound, basting every 30 minutes with pan juices, until an instant-read thermometer registers 160° F/70° C when inserted into the thickest part of the meat without touching bone. 8. Remove pan from oven, let stand 15 to 20 minutes before slicing. 1. Preheat oven to 400° F/205°C. 2. Cut bread into ½″ cubes; set aside. 3. In the bottom of the UltraPro 2-Qt. Casserole Pan, stir together onion, celery, garlic, and 2 tbsp. of the melted butter. Microwave on high power 4 minutes. Remove from microwave. 4. In a large bowl, mix together vegetables, remaining butter, bread cubes, egg, chicken stock, celery salt, pepper, and herbs until well combined and moist; transfer to the same UltraPro pan. 5. Microwave on high power 3 minutes. Remove from microwave; place pan in oven. Bake 10 minutes or until golden brown on top. Let stand 5 minutes before serving. 1. Preheat oven to 350°F/175°C. 2. Place potatoes in 1¾-Qt. Stack Cooker Casserole with ½ cup water. Cover and microwave on high for 8 minutes or until tender. Set aside to cool five minutes, covered. 3. Place onions, carrots and garlic in Power Chef System. Cover and pull cord several times to chop. 4. Heat Olive Oil in a Chef Series 11" Fry Pan over medium-high heat. Sauté onion mixture until it begins to soften and gain color. Add 2 tsp. of Steak and Chop seasoning blend and ground beef. 5. Sauté until no longer pink. Stir in flour, sauté one minute. Stir in stock and Worcestershire sauce and cook until thickened, add peas. 6. Divide beef mixture between four UltraPro 2-Cup Minis. 7. Mash potatoes slightly and place in base of PowerChef System With beater attachment installed, add remaining seasoning blend and milk. Cover and pull cord several times to blend, Spread on top of meat mixture, top with shredded cheese. 8. Bake uncovered 50—55 minutes or until potatoes are golden brown. 1. Cook shell noodles according to package directions, al dente 2. Preheat oven to 375° F. 3. Put spinach into a large skillet and drizzle with 1 to 2 tablespoons water. Cover and cook over mediumlow heat, tossing occasionally, until just wilted; drain well. When cool enough to handle, squeeze to remove any excess water. Chop spinach and transfer to a medium Thatsa bowl. Add garlic, ricotta, mozzarella, egg and basil to make the filling. 4. Spread a few spoonfuls of marinara sauce in the bottom of UltraPro 3.5-Qt. lasagna pan. 5. Fill each shell with spinach mixture and arrange in the dish. Pour remaining sauce over and around the stuffed shells and top with Parmigiano Reggiano. 6. Cover with foil and bake until hot throughout, 20 to 30 minutes, then uncover and continue baking until golden brown, about 10 minutes more. 1. Preheat oven to 400◦ F. In the cavity of each Cornish game hen add ½ cup of prepared stuffing. Place hens, breast side up, in the UltraPro 2-Qt. Square Pan. Rub each hen with butter. 2. Add carrots, parsnips and mushrooms to pan. Sprinkle vegetables and hens with salt and pepper. 3. Place pan in microwave. Microwave 12 minutes high power. Remove pan from microwave. Baste vegetables and hens with pan drippings. Place pan in oven. Bake an additional 20 minutes or until hens are golden brown and register 160◦ F on an instant-read thermometer inserted into the middle of the stuffing. 4. Remove pan from oven and let stand 5 minutes. Transfer hens to a cutting board. Cut hens in half lengthwise. Serve warm with vegetables and pan drippings. 1. Place chicken in base of UltraPro Roasting Pan. Season with 1 tbsp. Steak & Chop seasoning. 2. Invert Roasting Pan cover and place over base. Toss halved potatoes with olive oil and remaining Steak & Chop seasoning. 3. Microwave on high power 20 minutes. 4. Unstack the potatoes and chicken and place both into oven at 350°. Bake 20–30 minutes or until internal temperature of chicken reaches 165° F/75° C and juices run clear. Let rest for 10 minutes before slicing. 1. Preheat oven to 425° F/218° C. Season chicken with salt and pepper. 2. In a small bowl, combine butter, thyme, sage, rosemary, garlic, and salt. 3. Rub 2 tbsp. of butter mixture over chicken skin. Rub remaining butter under the skin and inside the chicken cavity. 4. Place chicken in roasting pan, breast side up. Microwave on high power 17 minutes. Remove from microwave, baste chicken with pan drippings; transfer pan to oven. Bake 17 minutes or until golden brown and internal temperature registers 160° F/70° C on an instant read thermometer. 5. Remove from oven. Let stand 10 minutes before serving. 1. Preheat oven to 325° F/162° C. 2. Place chocolate and 1 stick butter in 1-Qt. Micro Pitcher. Microwave on 70% power 1–2 minutes or until melted. Stir to combine. 3. In a medium bowl, whisk together sugar and eggs. 4. Add chocolate butter mixture to sugar and eggs, and stir in remaining dry ingredients. 5. Use remaining butter to grease UltraPro 2-Qt. Square Pan. Add batter to pan and bake 25–30 minutes or until toothpick inserted into center comes out clean. 1. Preheat oven to 350° F/180° C. 2. Add shallots, leek, spring onions and oil into the UltraPro Quiche. Place into microwave and cook at 800 watts for 3 minutes. 3. Add zucchini into the UltraPro 9” Round Pan. 4. Add eggs, parmesan, ricotta and thickened cream into a Thatsa Bowl Junior; mix to combine. Pour mixture into the UltraPro 9” Round Pan; gently mix together with the other ingredients. Season with salt and pepper. 5. Arrange tomato slices on top of tart. Place into the oven and cook for 30 minutes or until cooked through. 6. Serve with a sprinkle of fresh basil leaves and crumbled feta. 1. Preheat oven to 400° . 2. Place green onions in the base of the Power Chef System with the blade attachment; pull cord until onions are chopped. 3. Add the cream cheese, sour cream, bacon and cheese to the Power Chef System, combine all the ingredients until blended. 4. Place the mixture in a UltraPro 2.1-Qt. Round Casserole Pan with cover. 5. Bake in the preheated oven until hot and bubbling, 25 to 30 minutes. 6. Serve with assorted fresh vegetables, crackers and/or chips. 1. Preheat oven to 425° F/218° C. 2. Form dough to fit inverted cover of UltraPro 1.6-Qt. Round Pan. Bake 15 minutes. 3. Add carrots to base of Quick Chef Pro System fitted with the blade attachment. Cover and turn handle until roughly chopped and remove to base of UltraPro Round Pan. Repeat with celery and onion. 4. Microwave vegetable mixture, uncovered, on high power 1 minute. Add chicken to veggies and microwave, uncovered, on high power 5 minutes or until chicken is white and cooked through. 5. In Chef Series 11" Fry Pan over medium heat, melt butter. Whisk flour into melted butter. 6. Add milk to fry pan and whisk continuously until mixture thickens. (When the mixture reaches a boil it will thicken). Season milk mixture with salt and pepper. 7. Pour milk mixture over chicken mixture in Round Pan and stir to combine. 8. Remove pie crust from inverted cover and use to top pot pie mixture.